Join the discussion on our forums! Come discuss Ice Cream Peddler over in our dedicated Ice Cream Peddler discussion topic. With this card and Zentimo Freeze Shaman jumped from tier 7 to tier 5. As a person that crafted Moorabi I'll gladly accept these cards before he rotates out. 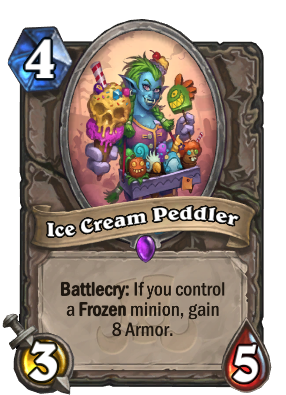 Does this gain 8 armor for each friendly frozen minion, or is it 8 armor even if you have a board full of frozen stuff? Edit: and the one she's holding might be: the adventure boss, also a boss card, the Giantfin. From competitive side I think this can see play in Evenlock. Drop Frozen Crusher on 6, then attack next turn, life tap, activate Peddler and maybe play Sunfury. 8 armor is kinda a lot and plays around Alex, but that's a tiny part. You also have Spellbreakers for surprise silence on your Crushers. great flavour, but it really isn't practical. 8 armor won't make Freeze SHaman viable and that's the only deck that wants to freeze their own minions. Tech choice against Freeze Mage meta? Using this with Hyldnir Frostrider, Baleful Banker, and Primordial Drake I think it's possible create a extreme stall Shudderwock Shaman. Acquiring armor, clearing board, and adding cards to deck every turn. The silly type of deck that is not made to win, but for the opponent give up. Great synergy with Hyldnir Frostrider and Shudderwock. I'm just gonna play it cause it gives me ice cream I won't lie. Finally a real upside to Cryostasis . Too bad Freeze Shaman still can't work. Hm. To stall the game against Jaina DK? Apart from that it sounds really weird. The best flavour is Armoretto. This is the flavor text, right?